In the middle of October, during a celebration of Space Science Day the director of the Space Research Institute, academic Lev Zeleniy made a sensational announcement that Roscosmos was beginning work on creating an inhabitable space station on the Moon. "Our next goal is to create a manned orbital station on the Moon. A special working team for this purpose has already been created under the guidance of the head of Roscosmos," Zeleniy said. The academician added that the main goal of this work team will be to combine the ideas and proposals of all leading cosmic companies specializing on the Moon. It is interesting that Lev Zeleniy has been known to frequently criticize the priority of manned programs and actually favours automatic systems. In other words his latest announcement can be regarded as a motion vector of Russian cosmonautics in interplanetary exploration. Nevertheless the main question regarding lunar "goals" is still unanswered. Why plan and start ridiculously expensive projects on lunar development? Besides everything else it is evident, that such a major cosmic event not one single country will be able to afford by itself. Meanwhile the Americans have winded down a truly promising human spaceflight program "Constellation" which had to with lunar research. At the same time numerous European countries, India, China, all states with serious cosmic potential, have not yet decided whether to start colonizing this satellite or not. Nonetheless, Russian cosmic officials are certain that this is viable. "The moon is the most interesting object, especially if we take the next step and create an on-planet station. Mainly this is because we have everything we need to supply this station with products for vital functioning (that is if water is found) - propellant fuel, building material- we have everything," says Yuri Makarov, head of strategic planning and target program department of Roscosmos. But once again, why is there a need to build an inhabitable station on the Moon? Today the only justified reason of this activity is that lunar research will help the procurement of a special helium isotope – isotope-3. After this isotope is brought back to planet Earth, it will be possible to use it as basic material for nuclear fuel. "According to scientists, the oil, gas and uranium supplies will last for approximately another 100 years, this is why searching for alternative energy is already necessary," says academic Eric Galimov, member of the Cosmic Council of the Russian Academy of Sciences. At the same time the cost of interplanetary delivery will be lower than the energy produced on nuclear power plants today. The academic is certain that the helium- 3 delivery all the way from the Moon "may become a reality, but for this we have to start working today." It is said that the Moon's supply of helium will make an energy-revolution possible and will forever solve the global power problem. Theoretically it is true. But the analysis of soil, which was brought back to Earth by Soviet station Luna showed that there is actually a lot of helium there- 0.01 grams in 1 tonne. But the problem is that there are no helium lakes on the Moon- the helium there is equally distributed on the satellite's surface. If you imagine that the thermonuclear reaction has already been achieved, then the annual helium demand of our planet is approximately 100 tonnes. That's actually not a lot- worth only a few "Space Shuttle" flights to our planet. But in order to achieve this amount, scientists will have to go through billions of tonnes of lunar soil. Besides this, achieving and finding the ultimate man-controlled thermonuclear reactions will take at least ten years and billions of dollars, according to scientists working in this field. Meanwhile till the end of this year China is planning on sending a landing probe up to the Moon. 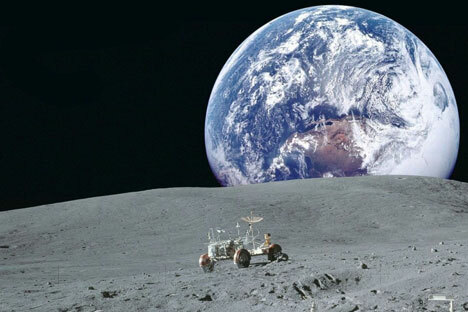 Having analyzed photographs, which the Indian landing probe Chandrayaan took, back in 2012 several American scientists say they spotted water in the abyssal rock of the Moon's visible side. The Japanese automatic station Kaguya, which was launched in the end of 2007, took high-quality photographs of the solar eclipse from the Moon. We want to believe that the Luna-Glob program, which is being constantly delayed, will not only land on the moon and take soil probe sampling, but also won't be sacrificed for the impressive, but far-fetched plans regarding Moon-management.